Buy A Small Organic Farm In Scenic Rainbow Canyon Just 100 Miles From Las Vegas. Records Show Mild Climate With 12-14 Inches Of Rain (Snow Is Rare), 8 Month Growing Season, 4 Months Of Mild Frost Risk, Summer Highs Near 100 And Lows Near 60. Farm Owners Are Looking To Sell Quickly For Personal Reasons. The Sooner That We Have A Buyer Means The Sooner That We Can Notify Employee And Lessor. Farm Is In 2 Parcels - 1 Acre Headquarters And 20 Acre Leased Parcel. Farm Is Off Grid With Solar Power At Headquarters. If You Are Interested In Just A Hobby Farm You Can Drop The Leased Parcel. Farm Owners Have Right OF First Refusal ON Headquarters. Farm Price Includes Asking Price For Headquarters Plus Existing Farm Debt. 2017 Farm Balance Sheet Estimates Value Of Equipment & Materials Near Most Equipment And Materials Were Purchased New And Installed Since 2014. 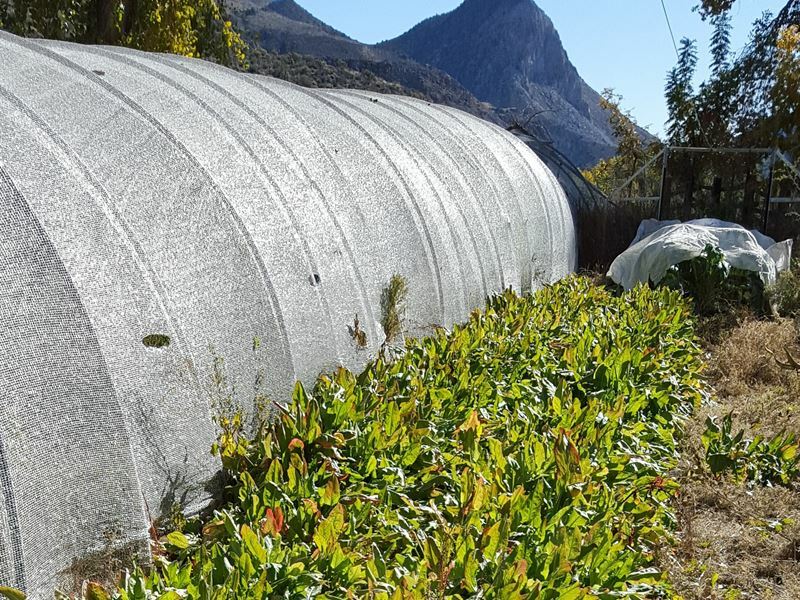 Approximately Of Equipment Is Installed On Leased Parcel Including Grundfos Solar Pump; 28,000 Sq Ft Multi-Bay High Tunnel With Aluminet; Drip Irrigation System; Trellising; And Deer Fencing For 1 Acre. The Remainder Of The Equipment And Materials Is Mobile Or Installed At The Headquarters. Half Acre Of Pvc High Tunnels; Drip Irrigation System; Trellising; Grundfos Solar Pump; 2.5 Kw Solar Power System; Perennial Crops And Deer Fencing Are Installed At The Headquarters. Headquarters Includes Shed, Former House (Workshop, Office, And Storage), And Trailer (Temporary Living Quarters). Leased Parcel Includes Cinder Block Home That Is Current Residence Of Farm Employee. Farm Is Worked Using Bcs Walk Behind Tractor And Implements Including Tiller, Roller Crimper, Mulch Layer, Chipper, Seed & Fertilizer Spreader, Sickle Mower, Utility Cart And Smaller Implements. Other Mobile Equipment & Materials Includes Cooler Trailer, Seed, Specialized Tools, Irrigation Materials, Electrical Materials, Etc. Farm Employee Was Trained In Intensive Vegetable Production This Year And Has Extensive Prior Experience With Poultry & Rabbits. Farm Employee Is Interested In Staying On Leased Parcel As A Caretaker Even If Buyer Does Not Continue Lease. Click here to email the Owner and get more information or schedule a viewing of this ranch.